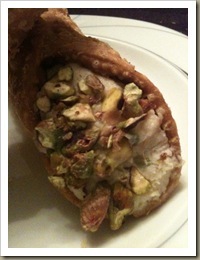 Home » Cannoli – Daring Bakers November. The November 2009 Daring Bakers C hallenge w as chosen and hosted by Lisa Michele of Parsley, Sage, Desserts and Line Drives. She chose the Italian Pastry, Cannolo (Cannoli is plural), using the cookbooks Lidia’s Italian-American Kitchen by Lidia Matticchio Bastianich and The Sopranos Family Cookbook by Allen Rucker; recipes by Michelle Scicolone, as ingredient/direction guides. She added her own modifications/changes, so the recipe is not 100% verbatim from either book. Ok, so I did do the challenge but I didn’t have my camera at the time so I just have pictures on my iPhone… so yeah. 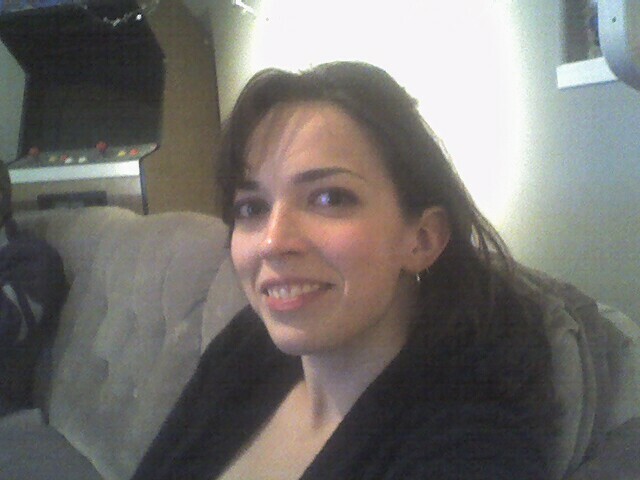 I will get the photos up ASAP! I enjoyed the challenge but I don’t know if they are any better than the ones you can buy at the Italian bakeries in town. They do them quite well and I don’t have to scrub oil off of the stove! 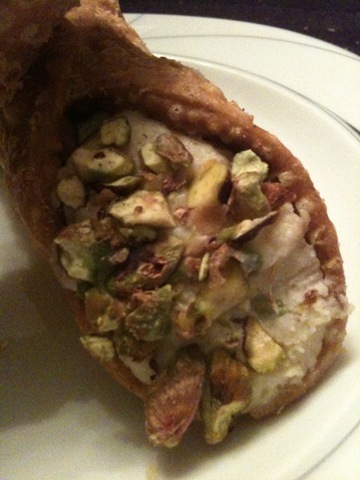 I made the traditional filling but decided to put chocolate chips in half of them and pistachio’s in the other ones. It was quite delcious and my father in law just finished up the last one tonight! If your up for it be daring and try to make them! Without further ado, CANNOLI! 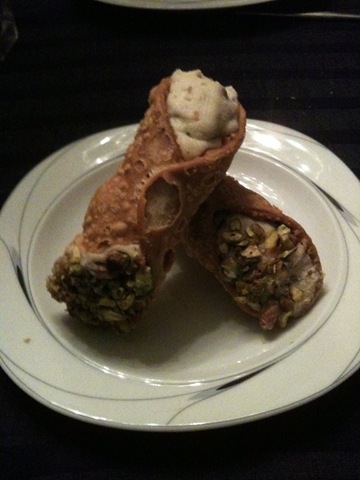 Required: Must make cannoli dough and shells. If you don’t have or do not want to purchase cannoli forms, which I would never ask of any of you, you could simply cut out circles, squares, or any shapes you want and stack them with the filling of your choice to make stacked cannoli's aka Cannolipoleons (directions below). If desired, you can channel MacGuyver and fashion something heat proof to get traditional shaped cannoli (6-8 inch sawed off lengths of a wooden broom stick or cane, sanded down and oiled, is THE authentic cannoli form! ), or non-traditional shapes such as creating a form to make bowls, or even using cream horns if you happen to have them. 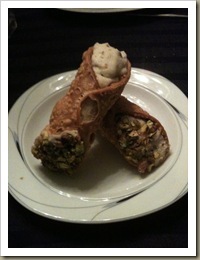 Mini cannoli would be great too, and I've provided links to retailers of cannoli forms of all sizes. Also, for those who don't like to cook or bake with alcohol - grape juice, cranberry juice, pomegranate juice, apple juice..any sweet juice of a fruit, especially ones used in or to make wine, can be substituted. Just add a little more vinegar to insure you get enough acid to relax the dough. 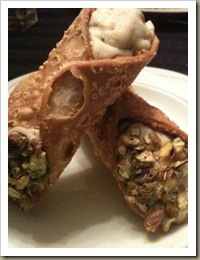 Wonderful effort on this challenge and your cannoli shells are so well blistered and warty well done. Cheers from Audax in Australia. Also your photos are so elegant and classy. Bravo bravo for the results. 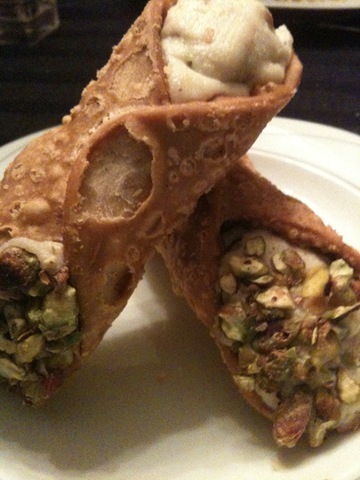 Beautiful, perfectly executed cannoli - blistery shells and all! Yes, it is easier to just buy them, but hey, now we all know how to make them, and can impress the crap out of people if we want LOl Thank you so much for deep frying with me this month!